Yesterday I left Cologne for Cambridge to visit my brother Nick. Steffi took me to the train station at around 11 AM. I took one train one stop and then switched trains. The second train took me directly into the Dusseldorf airport. We were in a bit of a hurry, so Steffi advised me to purchase my train ticket from the train company website. While on the first train, I did just that. It work perfectly and I received a little PDF of the ticket on my phone. When the train's ticket checker came by, I was ready with my eTicket. Unfortunately, the old guy was not pleased. He started yelling at me that these tickets must be "printed -- PRINTED --- PPPPRINNNTED." I just stared at him wondering what in the world he wanted me to do right now. Eventually, he just walked away. The funny thing is that each time I have traveled internationally lately, a random old German has lectured me extensively about something irrelevant. When the train arrived at the airport, I made my way to the gate with just enough time to grab a sandwich and some Vitamin Water. The water was much more tasty than in the US. I wonder what's different in their recipe. To board the flight, we walked out on the Tarmac (where it was snowing). This seems to be a theme in Europe. 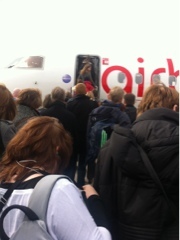 They are a big fan of boarding the plane from the outside. It certainly feels very exciting. Luckily, that was the only excitement. Not only did Air Berlin have better take offs and landings, they weren't selling scratch off lottery tickets or cigarettes. 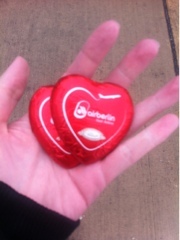 When I exited the plane, the very nice flight attendant handed me two chocolate Air Berlin hearts. Just before exiting the plane, I checked into the London airport (Stansted I think) on Foursquare. Foursquare had lots of tips from frustrated travelers who were frustrated about the immigration process at this airport. I assumed it must have been random and headed into the airport. The line at immigration was very long with only a two workers processing non-EU citizens. Immigration: You didn't fill out your occupation. Me: Oh, I'm so sorry! I didn't see that field. Immigration: If you would read the form, you would see it. Me: I'm so sorry. I must be overlooking that field. Can you point to it? Immigration: How long will you be here? Immigration: Why are you here? Me: To visit my brother. Immigration: Why is your brother here? Me: He's in graduate school. 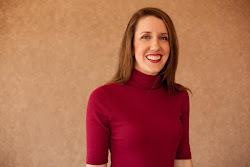 Immigration: So, you are returning to the US in two days? (Said in the voice that showed she definitely thought I should be going back ASAP). Me: No, then I'm going to another country (Let's call it Country A - I will save the name for later so as to not spoil the surprise for my readers). Immigration: Why are you going there? Me: To visit a friend. Me: No, then I'm going to another country (I'll also save this name). Immigration: (In a skeptical voice) Do you already have a plane ticket for this? Immigration: I'm going to need to see it. Me: Well, I don't have it printed, but I can show you my itinerary. Immigration: (looking at the itinerary on my cell phone) This ticket isn't leaving from Country A. What's going on? Me: I'm also going to another country. Immigration: Fine, you can come in. Unfortunately, my extended chat with the immigration agent caused me to miss my train to Cambridge. I caught the next one an hour later. Sitting on the train next to me was a tall, young guy from Holland. He was also going to Cambridge. When I asked what was taking him to Cambridge, he immediately (and with no hesitation) said, "I just failed out of my own college. I was partying all the time trying to make new friends in a new place. But it back fired and I failed. I'm now going to Cambridge to take an English class. I want to be able to put something on my résumé for this year besides working at McDonald's." I wondered what the poor guy's parents must think and how in the world he could spill such information to a stranger. From the train station, I took a taxi to Nick's dorm. The lives in what I would simplify down as a dorm, but is actually called Darwin College. It's a very interesting old place that overlooks a little river. We took a long walk around to check out Cambridge and eventually met up with two of his OSU friends for dinner. After dinner, I took a cab to my hostel. I walked up to the counter and spoke to a gruff woman in her early 40s. She seemed very unhappy or something... Something negative. She drilled off information about the hostel. I attempted to casually ask two questions, one being the time of breakfast. Me: What time is breakfast served? Hostel: Don't ask me this. It's not time yet. I will give you this information when it's time. Just wait. Hostel: So, let me tell you about breakfast. It is served from 7:30 am to 9:30 am. Then as she wrapped up my checkin, she asked about my room. Hostel: So, you are staying in a double room. By yourself. Is that correct? Hostel: Are you sure it's just you? Hostel: So nobody else is going to visit you? Hostel: Well, if anyone visits you,you will have to check them in at the front desk. They cannot just go into your room. They must be checked in. I definitely had my fill of strange people for one day. Time to sleep.